Facet joint injections are safe and effective non-surgical treatments used to relieve pain and inflammation in the facet joints of the spine. The bones of the spine (vertebrae) are connected to each other at the facet joints, which are located at the top and bottom of each vertebra. These joints allow the spine a range of motions. However, conditions like spinal stenosis, sciatica, herniated disc, and arthritis can cause damage to these joints, leading to chronic pain and inflammation. These may also be accompanied by limitation in spine movements, especially in the neck (cervical) and lower back (lumbar) areas. Aside from these areas, pain may be referred to other parts of the body such as the shoulders, upper back, buttocks, hips, groins, or down to the knee. A Chronic Pain Specialist may recommend facet joint injections to manage these symptoms and allow proper healing. 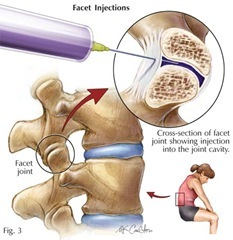 Facet joint injections aim to reduce the inflammation of the joints in the spine. Cervical facet injections reduce neck pain, as well as pain that spreads to the back of the head, shoulder or upper back. Lumbar facet injections, on the other hand, reduce the low back pain, as well as pain that spreads to the buttocks, hips, groins and knees. 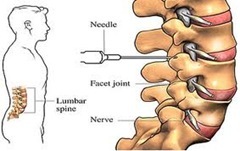 Facet joint injections are administered into the lining of the spinal joints where a soft membrane called synovium can become inflamed, causing pain and muscle spasm. The painful area is targeted and a combination of a local anesthetic and an anti-inflammatory drug (steroid) is injected to bathe the affected joint. The treatment has a localized effect, thus avoiding the widespread effects of oral medications. The result is a significant reduction of inflammation and pain over time, which allows one’s muscles to relax and consequently improves one’s mobility for a period of weeks or months. It also facilitates healing and improves a patient’s ability to resume normal activities as well as exercise. Facet joint injections are usually performed as an outpatient procedure by a qualified Chronic Pain Specialist who is an expert with the treatment. After thorough evaluation, the patient is briefed about the procedure and prepared beforehand so that he is relaxed. He may be given an oral medication to relax. The patient is asked to lie face down on the examination table. The injection site is first sterilized and then numbed using a local anesthetic. Using an imaging device to guide the placement of the needle, the doctor targets the affected facet joint and carefully injects the medication. The patient is monitored for about an hour before they are discharged. They will be asked to evaluate their improvement in the succeeding week and report for follow-up. Repeat injections may be performed up to three times a year if needed. 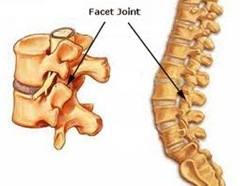 Facet joint injection is a minimally invasive, safe, and effective means of treating neck and back pains that are unresponsive to other forms of treatment. If you want more information about treating chronic neck and back pain, contact our Pain Management Specialist who will examine you and conduct tests to determine the cause of your pain. Make an appointment with the NYC’s top board-certified interventional pain management physician to know if facet joint injections are a treatment option for you.